The 3D printed model of Ballicopter© is a valuable learning tool that was developed in support of Ballyland Rotor app. The tool enables a child with vision impairment to explore the spinning propeller and practice the different ways to do the Rotor gesture, before performing it on the screen with the app. The model also allows the child to get tactually familiar with Ballicopter©, the main character in the app. View an accessible video of how the 3D model is used with the Ballyland Rotor app. Sonokids offers a FREE license to print and download the files. Note that this is a learning tool, not a toy. Children should be supervised with the model at all times. Not suitable for children under 3 years of age. Sonokids does not accept any liability for the print quality of the 3D printed model. Sonokids does not accept any liability for any personal or material damage as a result of the 3D printing or further processing and/or use of the learning tool, or any damage to or originating from the learning tool or the production process, the processing, assembling and painting as suggested by Sonokids. Printing, handling, assembling and painting is done at Licensee’s own risk. All copyright of the 3D print model of Ballicopter© remains with Sonokids®. Sonokids provides with you a free license that allows you to print the 3D model, or to have it printed by a third party, under the strict condition that you don’t resell the file, or resell the printed model. By downloading the .stl print files of Ballicopter, you confirm that you have read the disclaimer and that you agree to the conditions as set out above. Print the propeller upside down. Print the body in upright position. Depending on your printer, the model may be white or any other color. This depends on the color of the filament the printer uses. Recommended colors: red filament for the body, black or white for the propeller. If you want to paint the body, don’t fix the propeller onto the body yet. To assemble, carefully push and insert the propeller into the hole on top of Ballicopter’s body, until it goes ‘click’. Sonokids has taken great care in optimizing the design, but can’t take responsibility for any issues resulting from assembling the model, as this will be dependent on the individual quality of printing, choice of materials, as well as care of handling. Painting is easier if the propeller is not yet fixed onto the body. You can also choose to leave the model unpainted! Its tactile features will still be as recognizable and valuable as ever. To paint, use acrylic paint. If you have a red body printed, you only need black, blue and white paint. If the body is grey, white, or any other color, you may want to use red spray paint on the body first. Best then to use an acrylic undercoat, then red spray paint from a can. Then proceed with painting the eyes, and mouth, using tubes of acrylic paint and a fine brush. 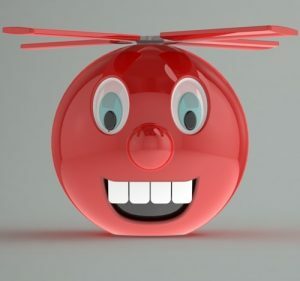 To paint our red 3D model, we used Jo Sonja’s Artists Colours Matte Pacific Blue (for Ballicopter’s eyes), Titanium white (eyes, teeth) and Black (pupils and mouth). Note: this is not work to be done by children!